The 2018-2019 Volleyball Team made it to the Semifinals for the first time in program history! 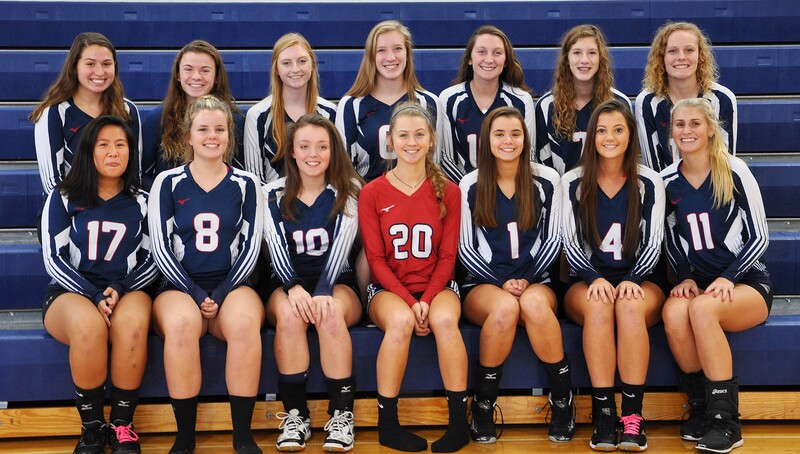 As the season started off this year for the Rockland High varsity volleyball team, they had some big shoes to fill. The Dogs proved this statement with their team chemistry on and off the court as well as quickly learning to play together. One of the major goals for the season was to keep their South Shore League Championship title. “I do believe that we can keep the league title this year. Although the competition maybe has improved, our mentality and the motivation of another league title will keep us focused,” said junior captain Caroline Elie. The team accomplished this on Thursday, Oct. 4 with a 3-0 victory against Randolph. Although they were already champs, the Dogs had another big game against Norwell. With a hard fought 3-0 victory they stayed undefeated in the league as they were last year. Along with competing and winning the league, the team set about preparing themselves for the tournament. The Dogs qualified for the tournament on their 10th regular season game with a 3-0 victory against Middleboro. Teams in tournament play are different from the teams you see during regular season. Following a great regular season, you wonder how successful a team can be in the tournament. “We still have work to do as a whole and individually. We need to work on mental toughness and getting ready for the challenging games we will face,” said senior captain Carolyn McCarthy. The team is great with the constant communication and staying positive with mental toughness. “The high energy of the bench is what allows us on the court to not worry about a bad play that happens. Instead, to shake it off and fight for the next point,” said Elie. Ranked #5 in the Division 3 South, the team first went up against Ursuline at home in the first round and got their first tournament win 3-0. Then it was on to Sturgis in the quarterfinals where they once again got the win, 3-1, earning a spot in the Semifinals against powerful Case High School. The game was played at Oliver Ames, a neutral site. In a hard fought, very tough match-up the Lady Dogs went down to defeat but not before gaining respect as the gritty team that they are. The second game was a real back and forth game which finally ended with Case in the lead 34-32. Coach Emily Murphy said,“For our first time ever in the semifinals, I thought we came out strong.” She also said, “I’m really proud of the way the girls worked and competed this year. I think our girls did a great job in that second game, staying mentally tough all the way through. They’re a great group of kids and I’m so proud.” The team ended up with an impressive record of 17-6 overall.